The relationship disability arts has with the mainstream is a tense, but exciting, tug-of-war. I spend a large amount of my time thinking about privilege. Who has it and why? What does that mean in larger contexts? In my experience, discussing identity in terms of privilege is a quick way to help identify normative societal constructs and to see disability as a social minority and culture as opposed to a medical condition. Privilege can come in different forms, and it’s worth acknowledging when you (collective and singular “you”) might be holding it, regardless of societal status. Very recently, I had the privilege of being quoted in The Guardian by Lyn Gardner. I am a fan of Gardner’s writing, and given that she said I had written a “fine article,” I was more than a little excited. What’s more, her article holds many parallels with what I wrote last month. My first reaction to this article was, and still is, one of praise. I find it exciting that a highly privileged establishment such as The Guardian would take on mainstreamed arts in a critically-engaged way. Gardner’s article discusses the impact of mainstreaming on wider artistic practice, and its “magpie-alike tendency to alight on what glitters and nab a bit for itself.” I agree with so much of what she says, but I do have one caveat. My quote is placed towards the end of her piece, part of a brief segue into disability arts, and for me, this is where I worry about where privilege might lie. One could read Lyn’s article as stating largely that the mainstream is completely bad and moreover, in the way she used my quote, that I think mainstreaming is completely bad. I don’t think that was the intention of the article, but I know that for disability, even an inkling of this attitude is dangerous, and speaks to the privilege in which Lyn’s article sits. It’s very easy to disregard the mainstream when you’re already living in it. I will never say that integrating disabled art and artists into the mainstream is negative. It is vital as it gives us visibility and the ability to present ourselves as a generative culture and an identity. More to the point, we’ve just barely started to get through the door. We do not need to give the doorkeepers any reason to push us out (again). My issue with the mainstream is one of tension, a tension that is essential to making great art. That tension is what I was writing about last month – without any intention of condemning mainstream disability integration and/or the multiple initiatives that are currently (finally) happening in UK theatres. Mainstreaming and integration presents what Horst Rittel, a scholar and design theorist, would describe as a “wicked problem”, meaning a problem that is extremely difficult or potentially impossible to solve. Struggles with identity are wicked problems, because they tend to appear contradictory. Disabled people want and need to be integrated, but we also want to keep our edge and our riskiness. As we are integrated we find more points of oppression and discrimination under the surfaces of our work. As Gardner says, we need to fight against the possibility of being subsumed under something that dulls down what we are and what we can do. This results in a constant tug-of-war which keeps things tense… and exciting. Obviously, the hope is that this wicked problem can be solved. The goal is always to reach for that utopian balance between equality and individuality. In the meantime, we have a lot of work to do to get there, a lot of ground to cover, and a lot of individual and collective needs to meet. For disability art, in a social climate where benefits are being cut and disabled people are literally dying because of the lack of privilege we collectively carry, we need the mainstream. For one thing we’re harder to ignore, oppress and discriminate against when we’re in plain sight. It is also wonderful to be visibly celebrated for our talent on a wide scale, something that we still are seriously lacking in comparison with our non-disabled peers. Integration gives us that and more. However, this does not mean we cannot be critical as we find our way into society’s mainstream. Normativity is fluid. We can want it and be wary of it at the same time. In fact, I think it’s essential that we sit in the middle of that contradiction, accept this wicked problem, this tension, this trouble, and use it to generate real discussions, real art and real growth. As an academic and a conscientious theatre practitioner, this is part of my job and definitely part of what makes inspires me to keep working. If this article confuses what I wrote last month, so be it. I believe everything I wrote last month, and much of what Lyn Gardner wrote in her article. However, I also want to be clear that while it is essential to be critical of mainstream normativity, it is dangerous for disabled artists to bite the hand that feeds us, especially as we have been starving for so long. So, though I do agree with a great deal of what Lyn Gardner said, I do also think that condemning the mainstream with regards to disability could be an attitude that could set us further back than we already are. We need to work with what we have, and if that means using the mainstream to integrate and finally diversify theatre, then so be it. As this happens, we will have to deal with the varying levels of privilege and the resulting wicked problems it presents. 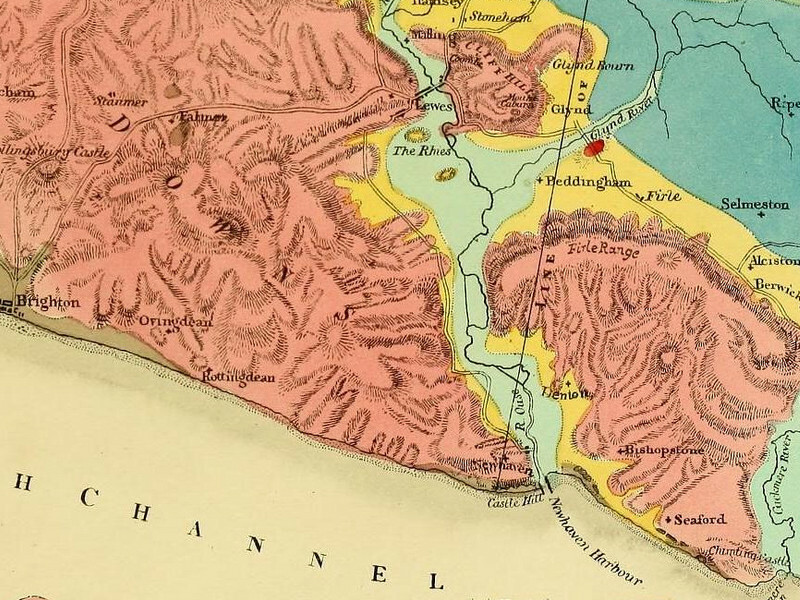 Detail of a map of the River Ouse meeting the British Channel from The Fossils of the South Downs by Gideon Mantell (Biodiversity Heritage Library, Creative Commons).